Gun control advocates often point to Australia as an example of how “banning” guns leads to significant declines in homicide rates. That sample sizes should be so small in Australia is not a surprise. Commentators on Australia often neglect to note that the country has a population smaller than that of Texas. Obviously, the demographics, geography and history of the two regions are extremely different as well. But with so few homicides to analyze in the first place, any asserted causality between the gun “ban” and homicide rates is indeed ambiguous. Other data suggests that Australia’s experience is less than useful as an example to the rest of the globe. The first significant modern gun control law in the UK was the Firearms Act of 1920. The Act abolished what had been up until then an assumed right to carry arms. The Act was likely introduced as an anti-Irish and anti-communist measure, as there was no evidence (then or now) of rising crime at the time. The 1920 act was followed by increasingly restrictive gun control laws in 1937, 1968, and 1988. 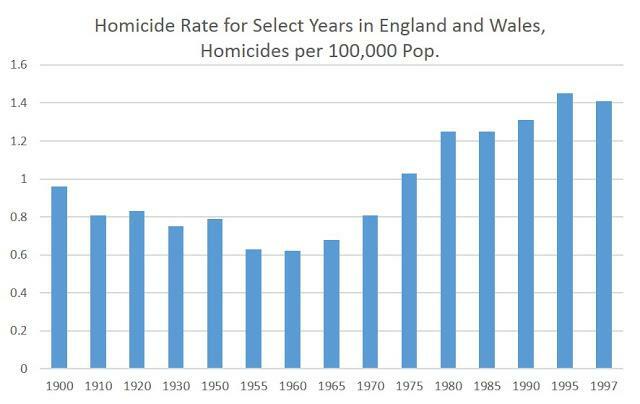 From the 1950s into the early 2000’s however, the homicide rate grew steadily. * Ryan McMaken (@ryanmcmaken) is the editor of Mises Wire and The Austrian. Send him your article submissions, but read article guidelines first. Ryan has degrees in economics and political science from the University of Colorado, and was the economist for the Colorado Division of Housing from 2009 to 2014. He is the author of Commie Cowboys: The Bourgeoisie and the Nation-State in the Western Genre. A hefty slice of this article is taken up by comments by a pseudonymous writer; if this person is not prepared to use her / his proper name then don’t publish or your credibility crumples.